Banking on our enriched industry experience, we are engaged in offering a huge gamut of Container Securing Products like Lashing Bars And Plates, D- Rings, Twistlocks, Container Lifting, Container Spare Parts, Flat Racks And Bins, Stackers and much more products relating to container securing. Lashing bars are used on the ends of the containers while aboard ship to securing the container stacks to the ship. Short bars of about 2500 mm go to the bottom of the 2nd container tier. Long bars of about 4500 to 5000 mm go to the bottom of the 3rd container tier. The bars have a swivel head on one end the can fit into the end of the container corner casting. 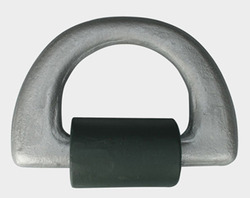 The other end is to be used in conjunction with the appropriate turnbuckle which in turn is secured to a d ring or lashing plate which is welded to the ships deck. Fully automatic Twistlock- Placed between containers in a stack and slots into corner castings. 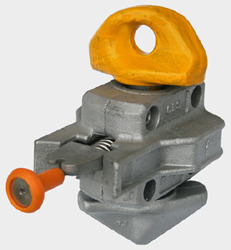 Semi-automatic Twistlock-Placed between containers in a stack and slots into corner castings . Looking for Container and cargo Securing Product ?